Проектирование самолета, получившего обозначение Airspeed AS.6 Envoy, началось в конце 1933 года. Он был задуман, как дальнейшее развитие удачного AS.5 Courier, увеличенного в размерах и оснащенного двумя двигателями. Прототип впервые поднялся в воздух 26 ДальшеMore>>> июня 1934 года. Всего было построено 49 самолетов этого типа. В стандартной компоновке Envoy вмещал одного пилота и до восьми пассажиров. Самолет имел цельнодеревянную конструкцию, с фанерной обшивкой, за исключением обтянутых полотном рулевых поверхностей. Особенностями машины были переставной стабилизатор и убирающиеся основные стойки шасси. Самолет выпускался с 1934 по 1939 год в трех модификациях. Первая, AS.6 Envoy Series I (построено 17 машин), не имела закрылков. На AS.6 Envoy Series II (13 машин) ввели разрезные закрылки. Третья модификация, AS.6 Envoy Series III (19 машин), была похожа на Series II, но в ее конструкцию внесли множество мелких доработок. В качестве силовой установки на Envoy могли использоваться различные поршневые двигатели воздушного охлаждения разной мощности и разных производителей. Самолеты Envoy экспортировались в Китай, Чехословакию, Францию, Индию и Японию. Для военных целей они использовались ВВС и ВМС Великобритании, а также южноафриканскими ВВС. Несколько машин приняли участие в гражданской войне в Испании. Первый Envoy Series II, поставленный RAF, стал первым самолетом в Королевском авиаотряде. Британские ВВС также приобрели две машины для службы связи в Индии и пять - для использования в той же роли в своей стране. По крайней мере один из них использовался во время Второй мировой войны ВМС, а еще три - ВВС. Южная Африка приобрела семь Envoy в 1936 году; три из них использовались ВВС и несли вооружение, включающее один неподвижный 7,7-мм пулемет для стрельбы вперед и один такой же пулемет на верхней турели. Четыре гражданские машины, принадлежавшие авиакомпании "South African Airways", можно было быстро переоборудовать для военного применения. Специальный вариант AS.6, получивший обозначение AS.8 Viceroy, был построен для участия в воздушной гонке MacRobertson в 1934 году. High Speed, Retractable Undercarriage and Long Range are among the Chief Features of the Latest Production of Airspeed, Ltd. IN the early part of last year Flight published the first detailed account of the Airspeed "Courier." This was the first British aeroplane to use a retractable undercarriage with all its attendant advantages. The "Courier," as will be seen from that description (March 23, 1933, page 266), was a successful attempt on the part of Mr. N. S. Norway and Mr. A. Hessell Tiltman to provide an aeroplane having a high cruising speed but which was economical to operate. Since that time a considerable number of "Couriers" have been built, and recently the 277 h.p. Siddeley "Cheetah" engine has been fitted instead of the "Lynx," thus raising the cruising speed to 150 m.p.h. Now, in response to a demand for a machine of rather better performance, but with the added safety of two engines, the "Envoy" has been produced. The first of these has been built, with Wolseley engines, to the order of Lord Nuffield for the England-Australia race. Others of the type are under construction, and one, designated the A.S.8, which will have supercharged "Cheetah" engines, will be flown in the race by Capt. T. N. Stack. As is usual with an aeroplane of this size for commercial purposes, the cabin accommodation may be varied to suit the purchaser. This first model will have seats for six passengers and one pilot. Obviously, by varying the number of passengers the amount of fuel carried may be altered and the range increased or decreased accordingly. With six passengers the tanks hold sufficient for a range in still air of 403 miles. Structurally the "Envoy" differs but little from the "Courier." In fact, the outer wing-sections are interchangeable between the two types. Wings and fuselage are mainly composed of plywood and spruce. The covering of the latter is three-ply wood, and of the former, doped fabric. 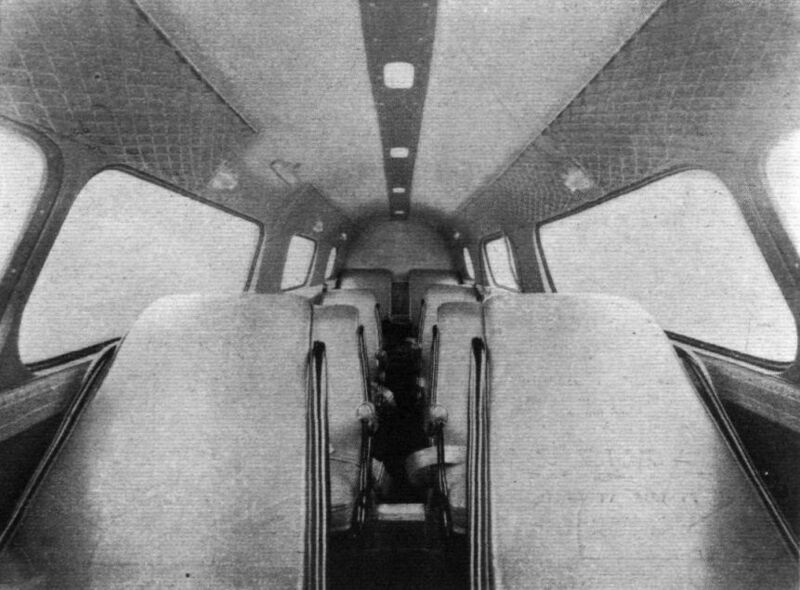 The front portion of the fuselage, forming the cabin accommodation for the passengers and pilot, is practically of monocoque construction, with a three-ply skin. Particular care has been taken to ensure that the passengers do not suffer from lack of light or ventilation. 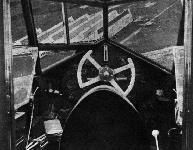 In the pilot's cockpit all the front windows can be opened so that they can be cleaned easily during flight. 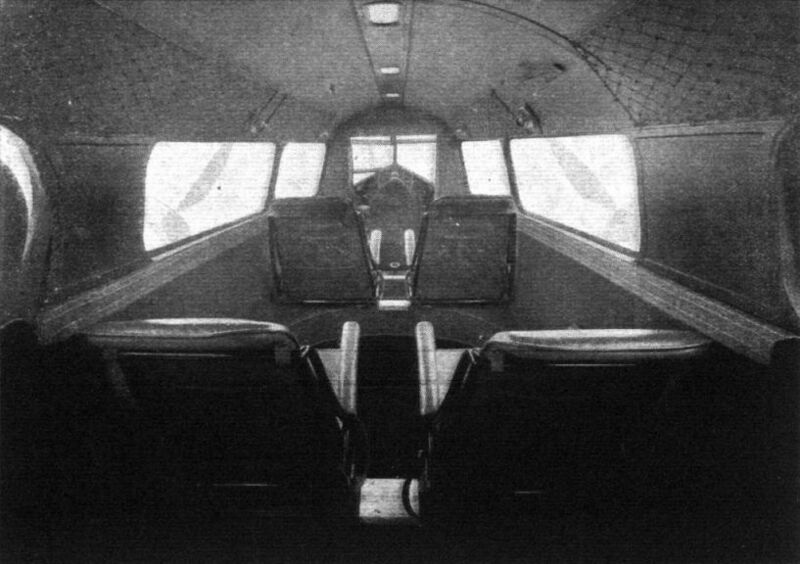 The centre-section, upon which the fuselage is mounted and which forms the cabin floor, carries both engines, the fuel tanks and both sides of the retractable undercarriage. This centre-section is built up as a single unit, with very heavy bracing between the box type spars. The outer portions of the wings are attached to these spars by heavy steel bolts passing through vertical hinges, which are secured to the spars by means of laminated steel plates, so that the extension planes can be quickly detached. These planes are heavily tapered both in plan form and profile, the section used being Clark Y.H. suitably "stepped" to give the necessary taper. Special precautions have been taken to ensure a high degree of torsional rigidity in the wings, so that the whole structure is extremely stiff. The main-plane spars are of the box type of construction, with spruce flanges and three-ply webs. The webs are particularly interesting as the plywood used has the centre lamination double the thickness of those outside it. Moreover, this plywood is laid on the spar with the grain of the wood at 45 deg. to the spar axis. In this manner a high strength/weight ratio has been achieved. The wing ribs are of spruce, as is the drag-bracing system, which has been designed to provide a high degree of torsional stiffness. The wings and Frise type ailerons are fabric-covered. The retractable undercarriage is almost identical with that of the "Courier," and is extremely simple. The Vickers oleo-pneumatic compression strut is hinged to the front spar in the same plane as the bent axle. The radius rod running backwards to the rear spar is divided unequally, the short portion being in front. 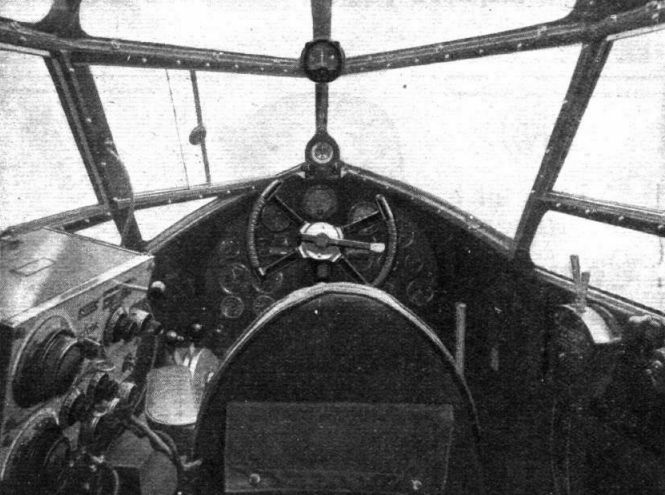 An oil cylinder is attached to the top of the rear spar, and in it is a piston with the piston rod attached to the front end of the longer portion of the radius rod. When the piston is withdrawn into the cylinder by means of oil pressure, the radius rod is bent and pulled upwards into the wind, carrying with it the undercarriage and about three-quarters of the landing wheel. This is arranged so that in cases of dire emergency on very rough ground the pilot could land a machine with the wheels in the retracted position, knowing that there would be no possibility of turning over on doing so. An electrical indicator system is fitted to tell the pilot the position of the wheels. 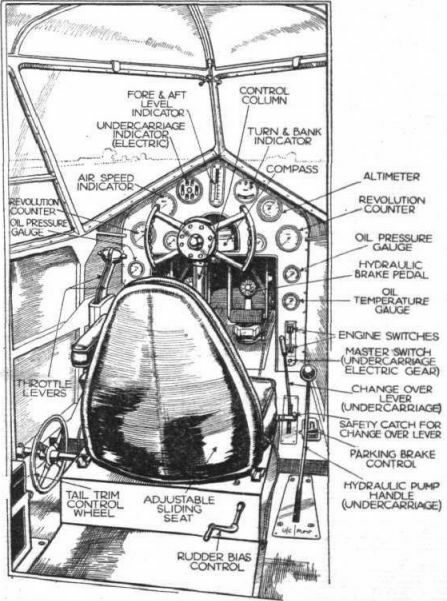 The flying controls provided for the pilot consist of a control wheel and parallel-motion pedals for rudder operation, combined with a very neat form of rudder bias gear enabling the machine to be flown easily in the event of a failure of one engine. Tail plane trimming gear is provided which operates in the normal manner. The whole of the tail units are extremely clean in design, and while being efficient offer very little drag. Although there are no external bracing wires or struts, both the fin and tail are exceptionally rigid, and great care has been taken to eliminate any possibility of flutter in the tail plane or rudder by maintaining a high degree of torsional stiffness throughout the whole of the rear part of the fuselage. KNOWN as the "Overseas Model," an improved version of the "Envoy" has recently been produced at the Portsmouth works of Airspeed, Ltd. It is fitted with two "Lynx IV.C" engines (240 h.p. at 2,090 r.p.m. ), which give a top speed of 174 m.p.h. 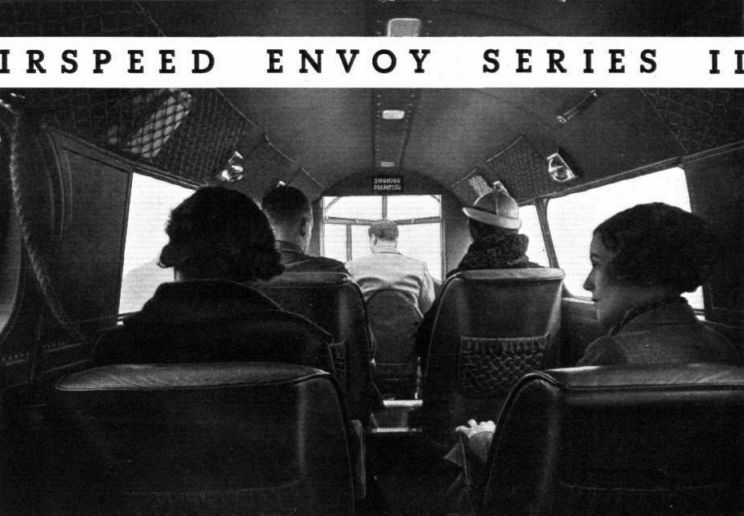 Basically, this "Envoy" is practically identical with that built for the late Mr. C. T. Ulm, and differs but little from the Wolseley-engined “Envoy” which was described in Flight of July 12, 1934. The cabin of this new model can be arranged either as a six- or eight-seater, and the performance in general considerably surpasses that of the previous machine. Certain structural alterations to the centre section of the wing have enabled the all-up weight to be increased to 5,850 lb., which means that, despite the extra weight of the larger engines, a usefully large payload is still permissible, with a long range. The well-known Airspeed retractable undercarriage is retained, and behind the engines are fairings very similar to those placed behind the "Cheetah" engines in the "Viceroy," which Capt. Stack flew in the England-Australia Air Race. The leading edge of the outer portions of the wings has now been completely covered with plywood extending from the top of the front spar around the leading edge to the bottom of the front spar, thus making a structure both rigid in torsion and so strong that it will not be damaged when pushed against while manhandling the machine. 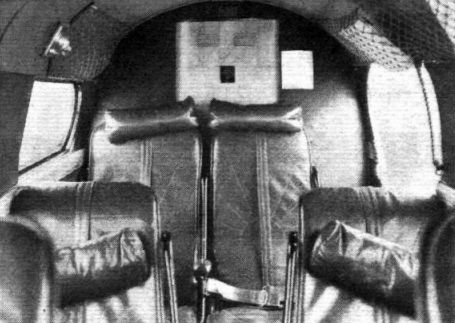 The cabin upholstery has been done, like that of so many of the well-equipped and comfortable aircraft nowadays, by L. A. Rumbold and Co., and in the model we tried the seats were very comfortable indeed. The general equipment is very full, with small folding tables and an ashtray for each seat. 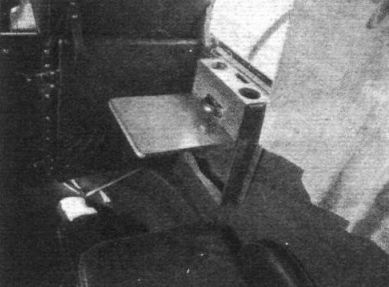 A Plessey A.C.44 wireless set is let into the after bulkhead of the cabin in a very neat manner, the remote control being contained in a very small box and mounted close by the pilot's right hand. Behind the after bulkhead is a spacious luggage compartment. The internal arrangements of the cabin can, of course, be varied to suit any individual operator's wishes, but the arrangement just described is one which should have a wide appeal for those whose flights are likely to be upwards of 400 miles. In the air the “Envoy” had all the attributes of a fairly heavily loaded high-speed machine - that is to say, in bumps the movement was comparatively hard, short, and sharp, but without producing any particularly disagreeable sensation in the passengers. Flaps have not been fitted, as the manufacturers feel that not only are the take-off and landing adequately short without their use, but that their incorporation would entail an increase of structural weight which would result in an undue decrease of payload. The take-off, considering that no flaps are fitted, is good; and, in the matter of landing, it must be remembered that the undercarriage, when in the lowered position, acts to a certain extent in the same manner as would flaps - that is to say, it increases the drag very considerably, and steepens the glide of the machine appreciably. Thus, although the "Envoy” is a clean machine with a high performance, it is still possible to land it off a steep approach over high obstacles. We did not, on this occasion, have the opportunity of piloting the machine, but from what we saw, and from the opinion of pilots who have flown it under both good and very bad conditions, it is clear that it retains all those most desirable characteristics which were embodied in the Airspeed "Courier," which was described in Flight of March 23, 1933. There is, of course, the usual tail-trimming gear, consisting of a screw-operated mechanism which alters the position of the leading edge of the tail plane; and, in addition, a rudder bias gear is fitted which enables the machine to be flown hands off with one engine cut out. Another refinement which many pilots will like is the aileron bias gear, whereby lateral trim can be altered, not only for single-engine conditions, but also to allow for the idiosyncrasies of pilots, the majority of whom fly with one wing slightly lower than the other. It is difficult to imagine any aeroplane which allows a better outlook from the pilot's cockpit. The deep, vee-shaped windows are at such an angle that they do not collect fine rain or snow, and are low enough to permit the pilot to look almost vertically below him. The large window in the front on his left-hand side is also split vertically, so that when the visibility is really bad half the window may be slid to one side, leaving an opening through which he can see clearly. About the operation of the retractable undercarriage we need say very little, as this has been described very fully in connection with previous Airspeed machines; the pump handle at the right-hand side is easy to work. This particular "Envoy" has been built for demonstration in India, and it left this week, via Spain, where Sir Alan Cobham, who was accompanying it, hopes to demonstrate. It will be flown by Fit. Lt. H. C. Johnson. WHEN the necessity for combining commercial efficiency with higher speeds inevitably drove designers to reduce drag as far as was practicable, it was obvious that some means had to be evolved for reducing this inspired cleanliness at will. No aerodrome in the world would be large enough - or, at least, sufficiently free from obstructions - for a machine in which the reduction of parasitic drag had been carried to its logical conclusion. With the arrival of the modern conception in high-speed transport machines, therefore, there came also the flap. Originally developed with the idea of increasing lift and thereby lowering the landing speed of machines with a high wing loading, flaps are looked upon by pilots, at least, almost entirely in the light of their capacity for steepening the approach. Certainly there can be few transport aeroplanes with an approach as steep as that of the latest Envoy with its split trailing-edge flaps lowered. Furthermore, this machine can be brought in safely at a speed which would hardly be credited by anyone who had not actually watched the A.S.I. Translated into bald figures, the stalling speed of the Series II has been reduced by 9 m.p.h. with the help of these flaps, and the landing run has been reduced by 50 per cent, or thereabouts. In its unflapped form the Envoy stalls at an indicated 55 m.p.h. ; the touch-down now takes place with the needle lying between 40 and 45 m.p.h. An average of twelve landings in a 5-m.p.h. wind gave, it is understood, a figure of 140 yards for the landing run. It was found, however, that the increased drag virtually balanced the increased lift during the take-off, which we roughly timed as taking 13 seconds in a 10-m.p.h. wind with a medium load. Unfortunately, the most pronounced effect of the flaps - during the approach - cannot be indicated with the assistance of figures, but can only be seen and felt. At a gliding speed of 60-65 m.p.h. this flapped approach can best be described as being as steep as that of a training type. At 50-55 m.p.h. it is even steeper, though the attitude of the machine is, of course, somewhat nose-high and the sink is pronounced enough to demand a little extra speed before holding off for the landing. Nor is any particular skill required for a short landing. Fit. Lt. C. H. A. Colman, of course, as the Airspeed demonstration pilot, can make the new Envoy do some very remarkable things, but, at the Heston demonstration last week, at least two pilots having no previous experience of the machine made approaches and short landings which would not have disgraced the pilot of a light aeroplane. Despite the many statements made by research experts, Mr Errington, the chief test pilot, claims that the flaps-down stall is quite innocuous and that the Envoy, which has in addition, rather pronouncedly tapered wings, does not tend to drop a wing even from a full stall. The loss of height, he says, is quite a lot less than in the case of the unflapped type - approximately 300 ft. as compared with 500 ft. indicated on a sensitive altimeter. If the machine is trimmed correctly for a 65 m.p.h. glide the effect of lowering the flaps is merely to depress the nose with no change in the indicated air speed. Aileron control remains down to the moment of stall. The normal hydraulic gear which is used for the retractable undercarriage is also used for the flap operation. 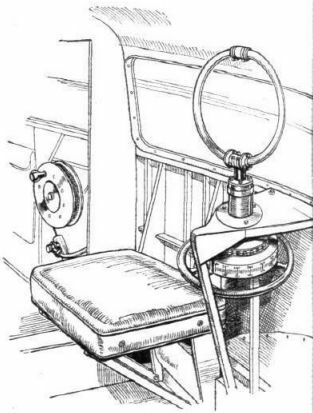 It may be remembered that, on previous Envoys, a pump handle and a change-over lever are placed to the right of the pilot. With the Series II a third lever is placed on the pilot's left, beside the tail-trimming wheel; according to its position the normal "up or down" control and the pump handle operate either the undercarriage or the flaps. 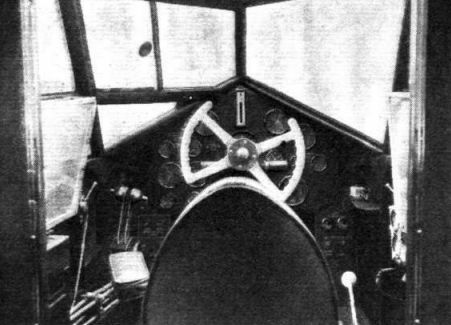 In the experimental model, at least, the flap position is indicated by means of a pointer on the right-hand side of the control cabin. In the air there is little chance that the pilot might make a mistake, since, with the undercarriage still up, the warning syren would indicate the fact as soon as the engines were throttled back, and, in any case, feel, sound and sight would tell him that the flaps, rather than the undercarriage, were being lowered. A very careless pilot might possibly pump the undercarriage up while the machine was on the ground, but in just the same way, he might also do a number of other foolish things in any aeroplane. One of the more interesting flying characteristics of the Envoy, incidentally, is that the take-off is best made tail down - with the trimmer wound well back. As soon as the machine leaves the ground the wheel can be wound forward again before attending to the undercarriage pump. The particular machine used for the demonstration was fitted with Wolseley Scorpio engines which, when turning over a t 2,200 r.p.m. gave a cruising speed of approximately 150 m.p.h. The Rotax electric starters were noticeably quiet and efficient in action. High performance for a modest power expenditure has been a feature of all Airspeed machines since Messrs. Tiltman and Norway first introduced the Courier some years ago. That machine, it may be remembered, was the first British low-wing monoplane to be fitted with a retractable undercarriage, and showed the way to still greater efficiency. The maximum speed of 173 m.p.h. with two Wolseley Scorpio engines corresponds to an Everling high-speed figure of 23.7, which must be regarded as good for a twin-engine type. At the same time the structural efficiency is good at 1.63, showing that, when equipped for passenger carrying, the Envoy carries as disposable load 63 per cent, of its own weight. Weight empty (with normal and electrical equipment) 3,572 lb. Total all-up weight 5,900 lb. Cruising speed at 75 per cent, power 153 m.p.h. Cruising speed at 62 1/2 per cent, power 144 m.p.h. Climb to 5,000 ft 6 min. "IT IS DIFFICULT TO IMAGINE ANY AEROPLANE WHICH ALLOWS A BETTER OUTLOOK FROM THE PILOT'S COCKPIT..."
This is what you see when looking into the pilot's cockpit through the bulkhead door in the passengers' cabin. 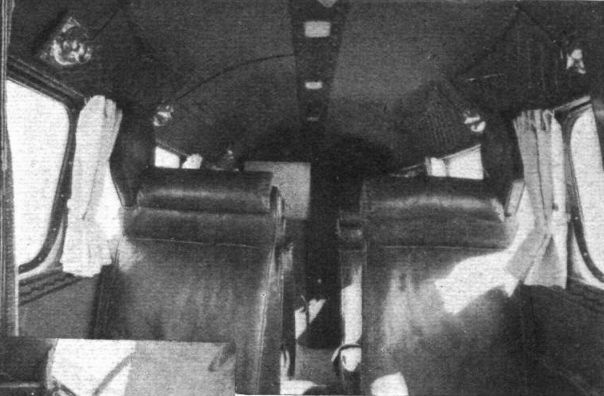 The cabin tanks of the Airspeed Envoy. The two large ones which are visible hold 53 gallons each, the small one is of 10 1/2 gallons capacity and there are two 49-gallon tanks in the wings. The D.F. 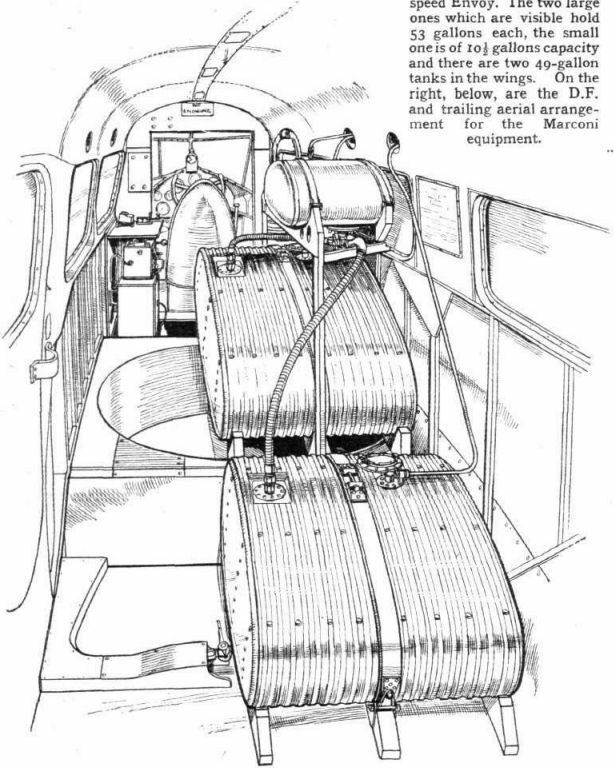 and trailing aerial arrangement for the Marconi equipment.